Many findings have documented the movements of aggregate public opinion on economic liberalism over time. By combining a series of EVS items, we point out that the French grew more skeptical of market capitalism well before the beginning of the Great Recession, and that all income and ideological groups have moved in parallel between 1990 and 2008. Yet by examining the extent to which individual-level differences can mirror the dynamics of politics and inequalities, we show that income does not influence statist attitudes equally on the right and on the left. Ideology thus appears to be a good predictor of attitudes toward economic liberalism and a powerful moderator of the influence of income. Finally, we suggest that the coexistence of different attitude dimensions might explain why the public's demand for redistribution has often been disconnected from election outcomes in France. Ascending Hierarchical Classification using Ward distance (Plane 1–2; Plane 1–3). Note: We kept only individuals’ coordinates on the first three axes to construct the classification. Overrepresentation of modalities within clusters compared with the sample average.Note: Clusters were determined by using Hierarchical Ascending Classification (HAC) whereby the distance measured between individuals is a Euclidian distance and the aggregation of individuals within clusters is completed using the Ward method. Active modalities that participated in the construction of axes in the factor analyses (MCA) are therefore also the ones ‘contributing’ to the creation of clusters. We also indicated the overrepresentation within each cluster of supplementary modalities such as ideology (left, right), income (by quintile), political interest (Int+, Int−), education (edu−−, edu−, edu+, edu++) or cohort. Example: among the ‘Classic Right’ the percentage of those who oppose the idea of state-owned companies is 35 points higher than the average for the whole sample. 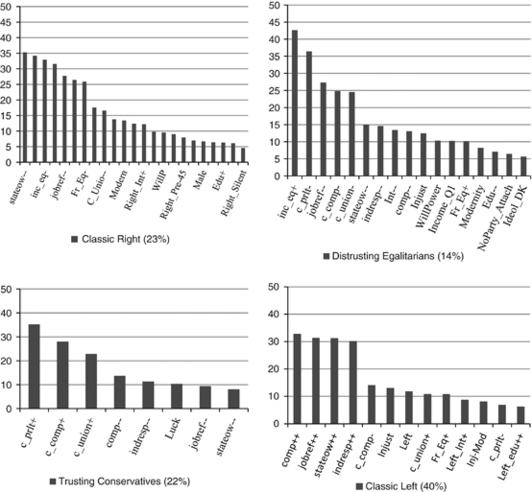 Mean points for ideological groups for each year on Plane 1–2 and Plane 1–3. Predicted values for ideological groups by year and by political interest.Note: Linear predictions from a model in which we let the impact of ideology on individuals’ score on Factor 1 vary over time by political interest while controlling for gender, age, educational attainment. Standard errors in parentheses ***P<0.01, **P<0.05, *P<0.1. Note: Total variance of matrix is 1.23720. Landais, C. (2008) Top incomes in France (1998–2006): Booming inequalities? Paris School of Economics, http://www.stanford.edu/~landais/cgi-bin/Articles/topincomes.pdf, accessed 25 January 2011. 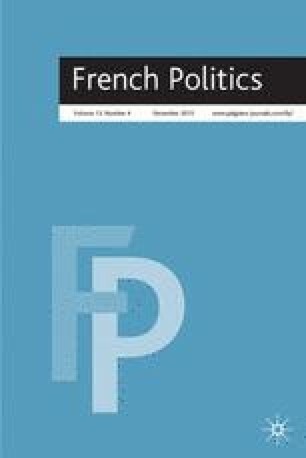 Tiberj, V. (2011) Les valeurs sociales et économiques de l’électorat. 18 November, https://sites.google.com/a/iepg.fr/trielec/resultats-analyses/enquetes-pre-electorales/vague-2---october-2011/lesvaleurssocialeseteconomiquesdel%E2%80%99electorat, accessed 25 January 2011.